In many regards the operation of total knee replacement has lagged behind that of total hip replacement by a period of about ten years and therefore as total hip replacement surgery took off in the early 1960s and early 1970s, successful knee replacement was delayed some ten years or so. Initially the attempts to replace the knee were fairly conservative using surface replacements as Charnley did in the hip but these implants lost the fixation in many cases and therefore the concept of replacing the whole articular surface as Charnley did in the hip was accepted. Early pioneers included Michael Freeman from the London Hospital and John Insall, also an Englishman who went to work at the Hospital for Special Surgery in New York. The results of the early total knee replacements of condylar fixation, condylar design and fixed with cement have been very good and success rates in the region of 95 per cent at ten years have been achieved. The knee is exposed, the joint surfaces are trimmed back using special jigs to allow the surgeon to accurately realign the knee. More recently computer techniques have been used to assist the surgeon. 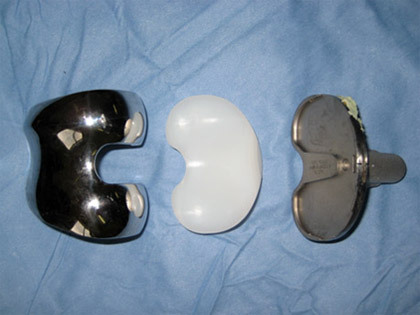 Image showing a condylar design of total knee replacement with the three components, the highly polished metal femoral component, the metal tibial component and the polyethylene tibial tray.